Roy Moore Has The Shitcanned Sadz - Joe.My.God. “This was a politically motivated effort by radical homosexual and transgender groups to remove me as Chief Justice of the Supreme Court because of outspoken opposition to their immoral agenda. This opinion violates not only the legal standards of evidence but also the rule of law which states that no judge can be removed from office except by unanimous vote.” – Shitcanned Alabama Supreme Court Chief Justice Roy Moore, via press release. Alabama Chief Justice Roy Moore’s judicial career is effectively over. In a ruling released Friday afternoon, the Alabama Court of the Judiciary suspended Moore without pay for the remainder of his term, which ends in 2019. Moore wasn’t removed from his position, so he won’t lose his title, but he won’t be able to participate on the state’s Supreme Court for the rest of his term. The embattled chief justice will also owe the state for the cost of the trial. 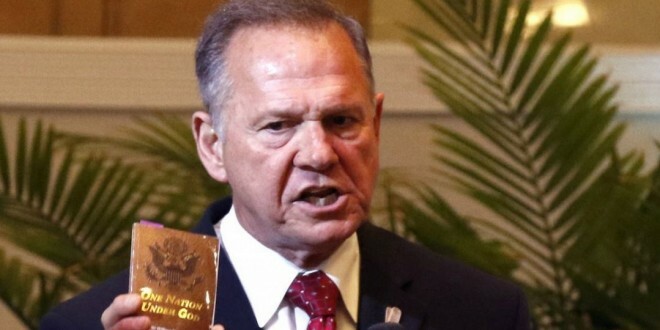 Moore was found guilty of violating the first, second and third canons of the Alabama Canons of Judicial Ethics. Attorneys for the Judicial Inquiry Commission, the acting prosecutors in the case, said Moore urged the state’s 68 probate judges to ignore federal law.